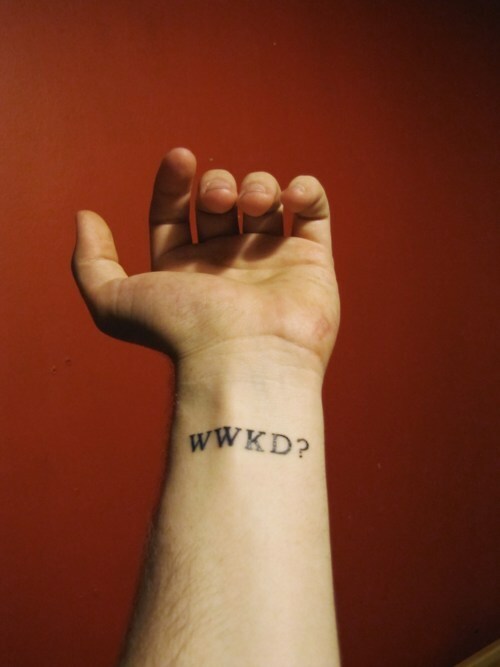 I could spend hours trawling through literary tattoos. They combine two of my favourite things; books and art. Although I don’t have a tattoo at the moment, I think that if I did it would definitely be words, probably a quote from a book. This one is probably my favourite, partly due to it’s simplicity, and partly because as I have already mentioned, Kerouac is one of my favourite writers. Many accuse books of being boring, but the energy present within this passage proves to me anything but. A love to read is an endless search for new stories, characters, ideas and words. Imagining my pile of unread books, or the extensive number of poems and plays I have yet to read fills me with hope and anticipation. I also think that part of the beauty of literature is the desire to talk about it with people, and that is part of why I have started this tumblr. I wanted a place to talk about the books I am interested in, as well a place to post the gems I find on the internet so be prepared for the occasional picture of tasty food, a Wes Anderson reference or anything else that takes my fancy. But mainly books.